Dr. Sailaja Golla greets 3-year-old Naomi, a Rett patient at UT Southwestern who is receiving medications to control symptoms such as self-injurious repetitive behaviors. A new study from UT Southwestern may explain why patients like Naomi display repetitive hand behaviors. DALLAS – September 26, 2016 – Three-year-old Naomi slaps her forehead a few times, bites her fingers and toddles across the doctor’s office in her white and pink pajamas before turning her head into a door with a dull thud. Her mother quickly straps on a helmet and adjusts the rainbow chinstrap, then watches as Naomi puts a hand back in her mouth and continues exploring the room. “She keeps me busy,” acknowledges her mother, Laura Elguea. Naomi was diagnosed at age 2 with Rett syndrome, a rare, debilitating disease in which patients progressively lose brain function and the ability to walk. While she laughs, smiles and toddles around like most 3-year-olds, Naomi’s repetitive hand behaviors offer clues to her condition. Relatively little is known about the neuronal causes of Rett syndrome, but UT Southwestern Medical Center scientists have now identified a process in the brains of mice that might explain the repetitive actions – research that could be a key step in developing treatments to eliminate symptoms that drastically impair the quality of life in Rett patients. The finding from UT Southwestern’s Peter O’Donnell Jr. Brain Institute could also potentially benefit people with autism spectrum disorder, though more research is needed to evaluate the link to this disease in humans. A new study led by Dr. Lisa Monteggia of UT Southwestern may explain why Rett syndrome patients display repetitive hand behaviors. The research could be a key step in developing treatments to eliminate symptoms that drastically impair the quality of life in Rett patients. 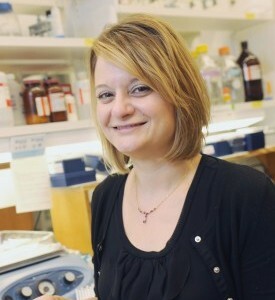 “We are exploring the processes that contribute to Rett syndrome in an effort to develop treatments that may prove useful in the disease,” said Dr. Lisa Monteggia, Professor of Neuroscience with the O’Donnell Jr. Brain Institute, who led the research published in Nature Neuroscience. The study demonstrated that MeCP2 – the protein that does not work properly in Rett syndrome – is among a group of three proteins that affect the function of a gene previously linked to obsessive compulsive disorder. Researchers were able to induce and then suppress repetitive behaviors in mice by changing the levels of these three proteins at the synapse – the communication junction between nerve cells. The research is a significant advancement in the understanding of how dysfunction in MeCP2 leads to key symptoms associated with Rett syndrome. Although MeCP2 was identified less than two decades ago as the cause of the postnatal neurological disorder, the link between the protein’s dysfunction and the specific neurological symptoms characteristic of the disease remains elusive. Rett syndrome affects girls almost exclusively, occurring in 1 of every 10,000 to 15,000 births and usually diagnosed by age 2. It is characterized by developmental regression, autistic traits, slow brain development, lack of speech, repetitive hand movements, seizures, and problems with walking. Many patients live beyond middle age, though not enough data exist to reliably estimate life expectancy beyond age 40. While current medications and behavioral therapy can sometimes diminish symptoms such as seizures and hand behaviors, no treatment exists to eradicate or reverse the disorder and the repetitive stereotyped behaviors, due in large part to a lack of knowledge about how MeCP2 dysfunction gives rise to these and other symptoms. Naomi’s doctors at UT Southwestern have prescribed a seizure medication and an antipsychotic medication to control some of her aggressive and self-injurious repetitive behaviors. Naomi is also receiving speech therapy, said her physician, Dr. Sailaja Golla, Assistant Professor in Neurology and Neurotherapeutics, Pediatrics, and Psychiatry, and Director of the Rare Autism Variants clinic at UT Southwestern/Children’s Health. Dr. Golla said she is encouraged by the study in mice and hopes the findings will eventually be applied to patients. 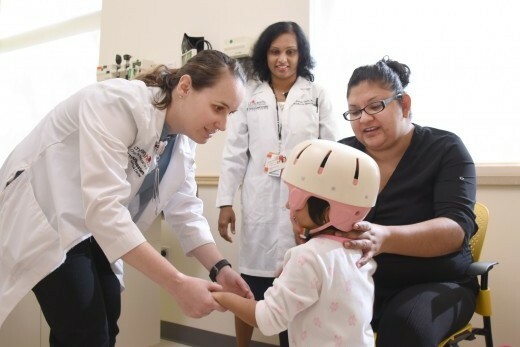 “Our goal is to make life better for these children with rare syndromes,” said Dr. Golla, who, along with Dr. Darrah Haffner, treats Naomi at the clinic. Naomi’s mother beams as she describes her daughter’s early speech efforts – she has called her father “Papi” and her 7-year-old sister “April” – and how she loves to watch cartoons at home. Yet, Ms. Elguea understands the challenges her daughter will face in the years to come. Laura Elguea (right) adjusts the helmet on her daughter Naomi, a 3-year-old Rett syndrome patient at UT Southwestern. Dr. Darrah Haffner (left) holds Naomi’s hand as Dr. Sailaja Golla looks on. A new study from UT Southwestern may explain why patients like Naomi display repetitive hand behaviors. Scientists have known that MeCP2 is essential for normal brain development and acts as a molecular switch that affects how other genes function. Patients with Rett syndrome and some cases of autism spectrum disorder do not produce MeCP2 or have too much of it, respectively, causing other genes to operate abnormally. But scientists have not yet identified many of the precise mechanisms by which this dysfunction occurs. Dr. Monteggia’s team found that MeCP2 controls the function of a gene called SAPAP3, which has been linked to obsessive compulsive disorder in humans. Disrupting the interaction between MeCP2 and the target gene SAPAP3 caused mice to groom themselves excessively; this repetitive behavior stopped after researchers reintroduced SAPAP3 into a particular brain region that is involved in obsessive compulsive behaviors. The research group also identified that MeCP2 formed a complex with histone deacetylase proteins, HDAC1 and HDAC2, to regulate SAPAP3’s function. “It is important to take these findings to the next level and seek ways to help patients enjoy their lives as normally as they can by addressing their symptoms,” said Dr. Monteggia, holder of the Ginny and John Eulich Professorship at UT Southwestern. The four-year study’s original aim was to examine how the removal of certain proteins from the brain could improve memory disorders, but the focus expanded after the study found that each of the mice lacking HDAC1 and HDAC2 began displaying Rett-like repetitive behaviors. In addition to the Rett-related finding, Dr. Monteggia’s team found that the removal of both HDAC1 and HDAC2 from the brain can kill neurons. This outcome is notable because studies elsewhere, as well as previous work by Dr. Monteggia’s group, demonstrated the potential for treating memory loss by selectively inhibiting the HDAC2 protein. Dr. Monteggia said this finding does not mean certain HDAC inhibitors can’t be effective, but the study does demonstrate that non-specific inhibitors and certain combinations may worsen the problem. The research is supported by funding from the National Institute of Mental Health. Other researchers include Drs. Melissa Mahgoub, Megumi Adachi, Kanzo Suzuki, Xihui Liu, Ege Kavalali, and Maria Chahrour, all in the Department of Neuroscience at UT Southwestern. Dr. Chahrour is also a faculty member in the Eugene McDermott Center for Human Growth and Development. Dr. Monteggia is a member of the scientific board of Rodin Therapeutics. Dr. Golla is a faculty member of the Center for Autism and Developmental Disabilities. Dr. Haffner is a Neurodevelopmental disabilities resident in training at UTSW/Children’s Health.